Great article from MarketingProfs, "The Disconnect Between Marketers and IT Buyers." 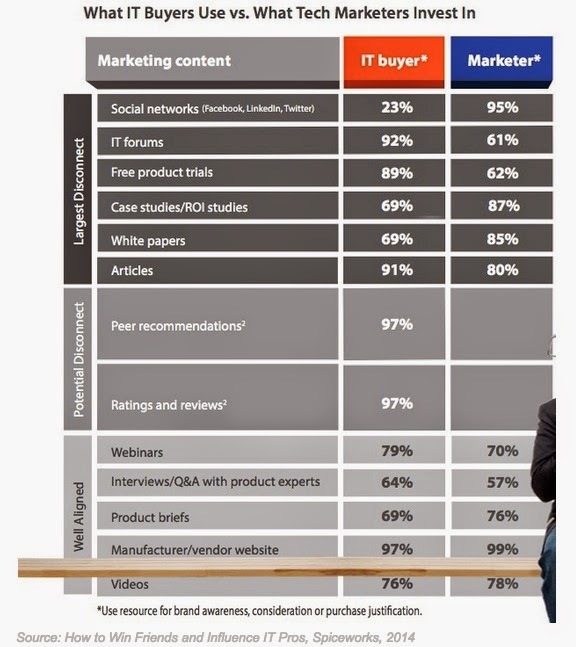 Lots and lots of good charts all pointing how marketers still need to better align their content creation plans with the actual needs of IT buyers. I like going back and reading some of my old posts. This one, from 2010, seems to stand the test of time. 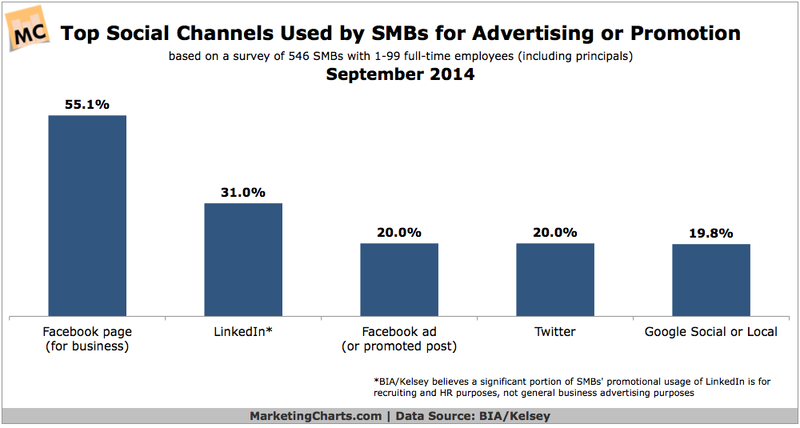 How much do you think B2B marketing has changed in just the last four years...? Tuesday morning in Chicago, I was perched atop a 38 story building listening to four top corporate marketers talk about how they have responded to the twin challenges of a recession and the impact of social media. No, I didn't parachute in to some secret industry confab- I was attending the BtoB Magazine NetMarketer breakfast being held at the Hotel 71. 60% of sales for the Broadband Mobility Solutions group are in the government, enterprise and telecom markets. That's a heavy B2B focus. And like any good B2B marketer, she says that her main focus is to accelerate the sales cycle and support the customer relationshiplifecycle. I couldn't agree more. In order to do this, she and her team have spent a great deal of effort modeling the interactive experience and developing content for each stage of the buying cycle. Motorola's strategic planning even includes developing personas for each market segment at various stages of the buying cycle. She points out that unlike in the past, they have been tracking and optimizing "off-corporate site" content to develop links and traffic. As an example of this, they created an "shared experience" website to support event marketing that aggregated content related to a trade show along with corporate info and online product demos. The online demos drew 50% more activity than the in person demos at the show. Belinda also gave a informative presentation at the Boston NetMarketing Breakfast, as profiled by my colleague Marc Hausman. Steve presented a case study of his work. The recent financial crisis and recession has created a market for distressed banks, called FDIC assisted transactions. These transactions occur when medium sized healthy banks buy all or parts of bad banks that have gone into receivership at the FDIC (which is the government bank regulator). PWC is very interested in providing consulting and accounting services to the banks doing the buying. The challenge is that PWC hasn't traditionally marketed to mid-sized banks and the transactions in question tend to coalesce rapidly and move quickly to completion. Speed is important. Identifying leads and moving them ASAP into a sales environment is the key to capturing these deals and driving revenue. Stripping out any superfluous activity, Steve designed a lead generation program by creating and distributing content on American Banker magazine, in house webinars, amicrosite/landing page along with a Google AdWords program and an keyword optimized section on pwc.com. He can now identify hot leads by the number of hits across those sites and by driving traffic via email and Google to the landing page. Recently, he had 500 attendees to a webinar, of which 50% were individuals not previously known to PWC. Using polls and surveys during the session, he was able to qualify those most likely to buy and pass them along to the sales team internally. The ROI? Due to the high fees involved, closing one deal pays for the entire program. In the interest of openness and transparency, it's probably worth pointing out that Microsoft is a client of Strategic Communications Group and we worked with Kristin from the beginning to develop, execute and improve the program she presented. The challenge when marketing to state and local governments is varied and disparate nature of the market. Although 40% of Microsoft's revenues come from the big four states of California, Texas, Florida and New York, that leaves a massive amount of clients and prospects to be communicated with across 46 states. Due to the challenge of reaching out to this market, it became clear that social media was going to be a central part of any marketing plan. Rather than attempt to build a complicated social media platform right off the bat or just tactically start "doing stuff", she began by developing the strategy that all activity had to support one main brand, "Bright Side of Government." Due to the sheer number of products Microsoft offers, its important to give government IT professionals an organizing idea and position Microsoft as helping them interact with their peers, share best practices and learn how to better support their government entities' missions. Microsoft is counting on users to input their government's social media usage on the website in order to populate it. It's been seeded with as many as 500 pieces of information and is now open for visitors to add more or edit existing entries. Kristin Bockius, social media marketing manager for Microsoft SLG, said the company believes the website will fill a niche for those who are seeking a directory of social media activity in the state and local government. "We really want to use this site to show how many SLG agencies as well as individuals are using social to reach out to citizens," she told Government Technology on Tuesday. When the website is populated with enough data, it will be possible to analyze what the top 10 states and cities are for social media, and so forth, Bockiussaid, "so you can start to figure out what sort of agencies it does and doesn't work for as well as who's the best at it." In future weeks, the website will add podcasts, analytics, examples of highlighted case studies and best practices, Bockius added. The company may also add data on social media usage to the website for the federal government and worldwide governments. And to be included on the site, a government doesn't have to be a Microsoft customer. "It doesn't matter what tools they're using," she said. "We're just trying to get the word out and trying to get people to use the social media and highlight some of these cool ways they're doing it." Lawson is a distributor of maintenance and repair supplies. Yes, like fasteners and screws. But with $400MM in revenue and publicly traded on the NASDAQ, Lawson is a very successful distributor. Judy's role is to support a massive cadre of 1300 independent sales representatives. These sales reps are generally deep in the trenches, meeting with buyers on loading docks, shop floors and repair departments. While objectives like brand presence, web traffic and engagement across a variety of channels is important, supporting the sales force (and the huge catalog of products available) with engaging content is a key challenge. Customer videos, product demos, etc are routinely created that are valuable content to the buyer while supporting Lawson's main messaging of "Smarter Maintenance" and "Think Beyond the Bin." Segmentation is a key part of the process to make sure the right kind of content goes to specific sub-groups of buyers. Jody says listening is important- Analyzing web traffic, Google alerts and email response rates tell her how successful a video is doing. Is Friday the Best Day for Press Releases? PR people have been arguing about this forever. 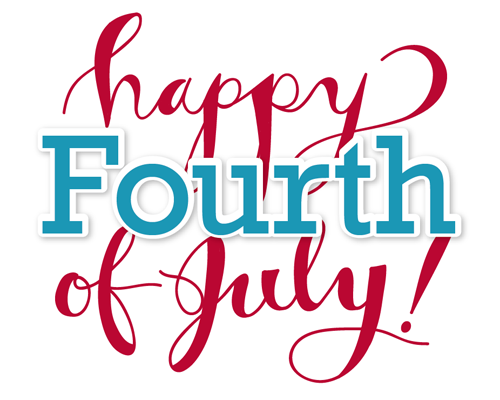 Online, stories are posted anytime, so the day of the week might not be that important. However, a lof of publications still have mid-week deadlines, which means that the reporter is likely going to be busier those days working on stories. However, it's also interesting to note that the data in the above story is from when Crunchbase publishes a funding announcement, which is obviously 1-3 days after company sends out the press release. The author didn't really address that lag. 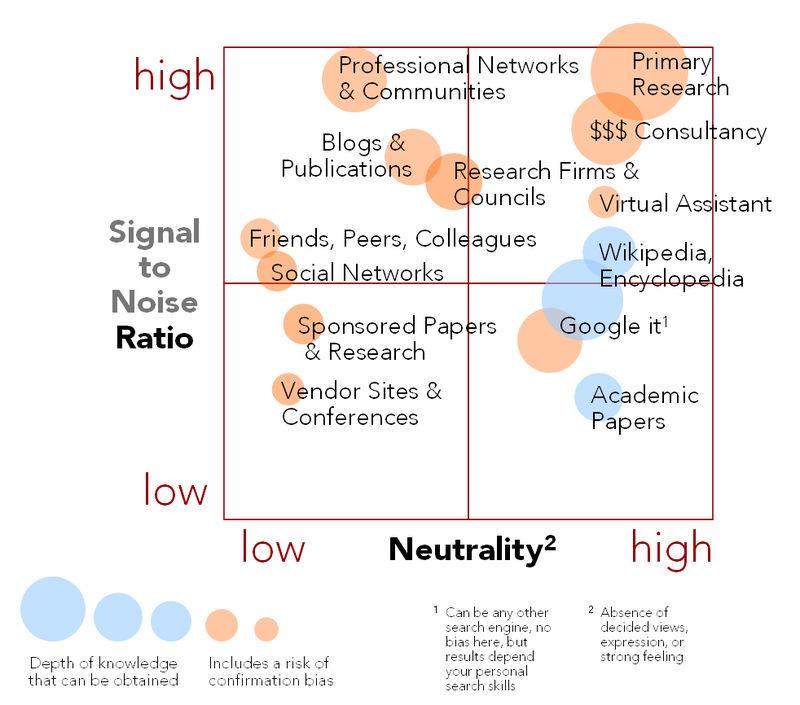 Still, interesting to read a data-driven analysis about public relations results. 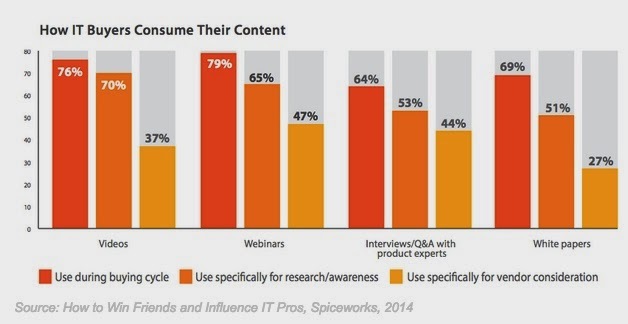 What Types of Insights-Based Content Do B2B Marketers Find Most Effective? 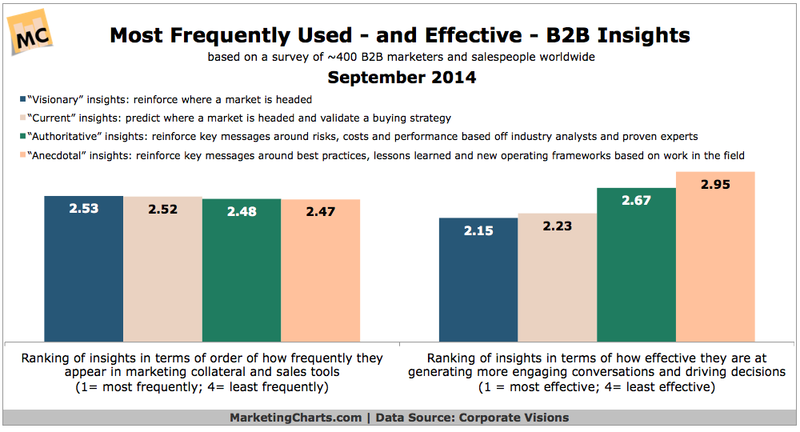 Marketing Charts Link: What Types of Insights-Based Content Do B2B Marketers Find Most Effective? Which Types of Brand Communications Most Influence Purchase Decisions? 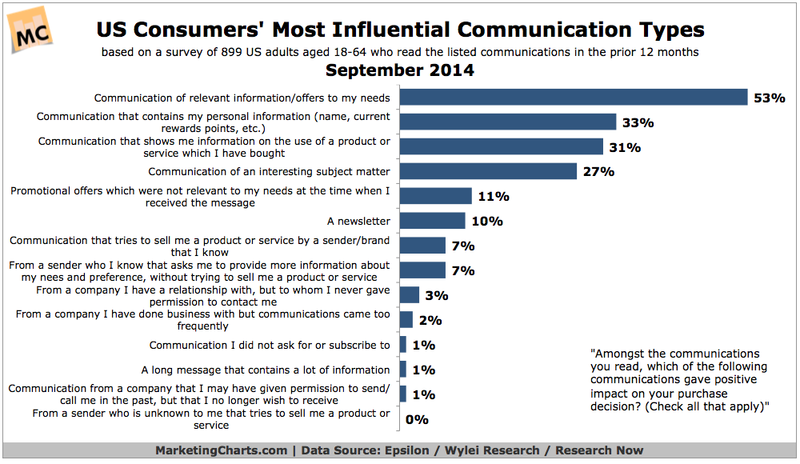 Marketing Charts Link: Which Types of Brand Communications Most Influence Purchase Decisions? Measurable Business Results? Uh, How about Revenue and Growth. 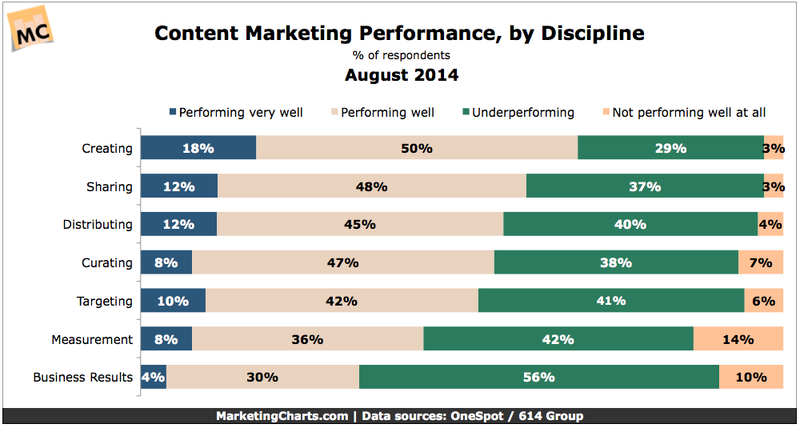 A new report on content marketing is out. It shows marketers feel they are doing a good job creating content, but are having trouble tying their efforts to measurable business results. Uh, how about revenue and growth? Content marketers have fairly clear-cut objectives, but the majority are falling short of meeting them, details a new report [download page] from OneSpot and 614 Group. The survey finds that B2B marketers are largely focused on lead generation, echoing other research on the subject, while brand engagement is the top objective among B2C marketers. For the time being, though, a slight majority feel that they’re not meeting their content marketing objectives, and most feel that they’re underperforming when it comes to the business results of their efforts. How Do Enterprise Buyers Research New Software? Marketers often have a hard time explaining the value of content marketing. I hear sales focused teams ask "why do we have to write all of this stuff?" Well, one of the many, many reasons is that prospects evaluate various sources when making a buying decision. Everyone starts with a google search and gets deeper from there. 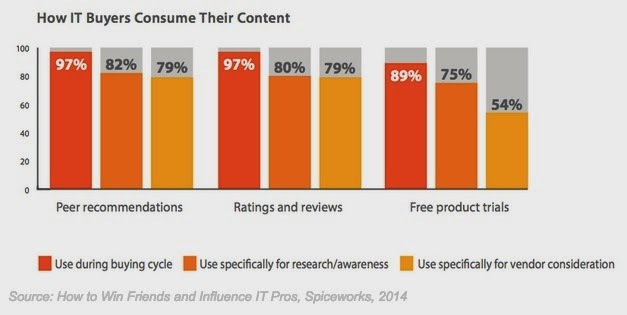 Your company needs to be creating or influencing the creation of as much content in the chart below. Source: How Do Enterprise Buyers Research New Software? Often I talk with clients about the connection between branding and marketing. Almost all the time, there is a great deal of confusion. I bet you, reading this, are a little confused. This article, Where Marketing Ends, Branding Begins from Kiss Metrics, is a very good, easy to understand overview. 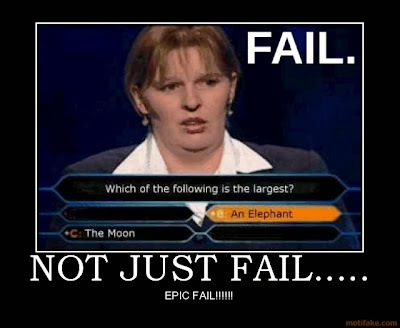 What do most people get wrong? Misconception #1: Branding is marketing / advertising / promotion / anything to that effect. Misconception #2: You are the ultimate authority when it comes to your brand. Misconception #3: There exists a formula for success when it comes to branding. Is your email marketing as successful as you would like? Is your email marketing as successful as you would like? Probably not, eh? We all know that great content and constant testing are keys to success, but what does that really mean? So what are the six steps? Lead Generation? You Are Not Doing It Right. 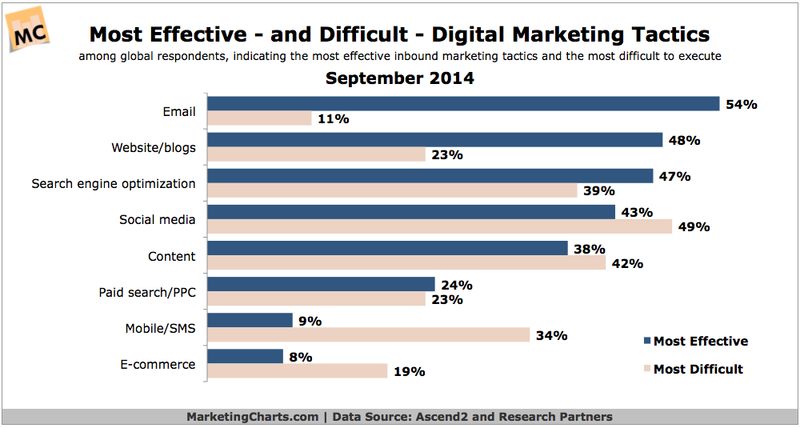 Lead Generation is the Most Important Thing for B2B marketers. Are you doing it right? Probably not. Spending all day on social media and getting no results should tell you something. Are you integrating marketing with sales? Are you creating compelling content that is targeted to specific issues? Do You Know What Your Online Media Mix Looks Like? Most non-marketers have no idea how to think about their marketing efforts. Need a quick primer on the different kinds of content that you need to be producing? Good read. Basically, strip out bias by focusing on product and sales. This a really good post about the leadership lessons learned by General Stanley McChrystal. I haven't read his book, but this links to a quick round up. Need more traffic? Who doesn't, right? A little old, but I think everyone should read this. You need to know all of these trends in order to plan for the future. It is a long article (with tons of awesome charts), so here is a quick summary. You can argue about some of these trends, but you have to acknowledge that something important is happening in each area. 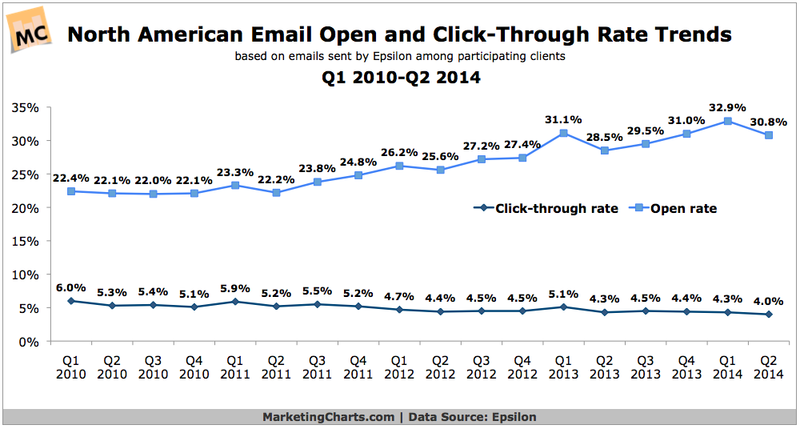 Why marketers should keep sending you e-mails? E-mail remains a significantly more effective way to acquire customers than social media—nearly 40 times that of Facebook and Twitter combined. That’s because 91 percent of all US consumers still use e-mail daily, and the rate at which e-mails prompt purchases is not only estimated to be at least three times that of social media, but the average order value is also 17 percent higher. Everyone should read this article right now. Looking for an excellent and comprehensive overview of how to create evergreen content? Well, look no further. Will people still read this and think it’s interesting a year from now? That’s the goal of evergreen. Evergreen content must hold its relevancy over time or else it risks losing its value. The Big Question—will this content endure?—is thankfully something you can control, to a degree, by taking steps to ensure that your evergreen content is set up for success. Keep creating amazing content, and follow these guidelines to make the amazing timeless. Read this very detailed look at marketing analytics. In a new paper, Bizible analyzed data from the more than 480,000 leads that have been tracked through its Salesforce marketing analytics platform to provide insights on how marketers should be thinking about attribution modeling and why the traditional last-click model is broken. When looking at last touch only, Bizible found that search accounted for 41 percent of the leads generated. Yet, when considered by first touch, search, in fact, drove 56 percent of the leads. Furthermore, the combination of search first touch and search last touch was the most productive sequence for lead generation, accounting for 37 percent of all leads from first/last touch combinations. When Should I Post to Social Media? Think you know all about social media? Think again. Check out the ten facts below, but make sure to click through and read the whole article. 1. The fastest growing demographic on Twitter is the 55–64 year age bracket. This report seems to align with what I'm seeing here in DC. The key findings are as follows. Bay Area still on top: As a whole the San Francisco Bay Area — which includes greater San Francisco and Silicon Valley — accounted for more than 4 in 10 of all venture capital dollars invested across the entire United States. The city of San Francisco leads the way: San Francisco proper now attracts a larger volume of venture capital investment than Silicon Valley. East Coast Acela Corridor ranks 2nd: The Boston-New York-Washington corridor on the East Coast has emerged as the second major center for venture capital investment. New York City is a rising startup hub: Metro New York is now the nation’s third largest center for venture capital. Nearly 80 percent of the metro’s venture investment was invested in the city itself. College towns attracting venture capital too: College town tech hubs like Austin and Raleigh-Cary in the North Carolina Research Triangle have long been magnets for venture capital, but Boulder, Ann Arbor, and Lawrence, Kansas attract considerable venture capital on a per capita basis as well. Talent matters: Venture investment tracks the geography of talent, especially the percentage of adults who are college grads and the creative class. Eds and meds don’t matter for tech: While many states and cities have pinned their hopes on education and medical centers, our research finds little to no significant statistical associations between eds and meds employment and venture capital. Tolerance does matter: We find venture capital investment to be associated with several markers of the diversity of metros, including their shares of immigrants and gays. This was posted back in December, but I think all of the trends are important this year. LOL. Pretty spot on overview of what not to do when fundraising. The bottom line: understand that sleep is highly individual, and to ensure that you can fall asleep when you need to, train your brain into knowing when it's time to turn the lights off. I think we’ve established by now that what happens in Vegas actually never stays in Vegas. And, as you can see by the agenda obtained by TechCrunch that’s embedded below this post, the Goldman Sachs Private Internet Company Conference scheduled to take place in Sin City over the next two days is no exception. The Goldman Sachs conference for private web firms is one of the most high-end and hush-hush events in the tech world. It’s essentially like the Hackers Conference or dinners at Sheryl Sandberg’s house or Fight Club, except for tech executives who are likely to soon go through an IPO or big M&A deal. If you’re on the invite list, you’re in pretty good company — and the first rule is that you don’t talk about it to others. Is Your Business Failing at Content Marketing? I like this article from Inc.com- 6 Reasons Companies Fail at Content Marketing, by Dave Kerpern. Do yourself a favor and evaluate your content marketing strategy after reading the article. They have no subscription strategy. They fail to inspire brand evangelists. They still keep their content creators in silos. They place traditional marketers in content roles. They overlook internal marketing goals. They miss out on opportunities to partner with traditional media. 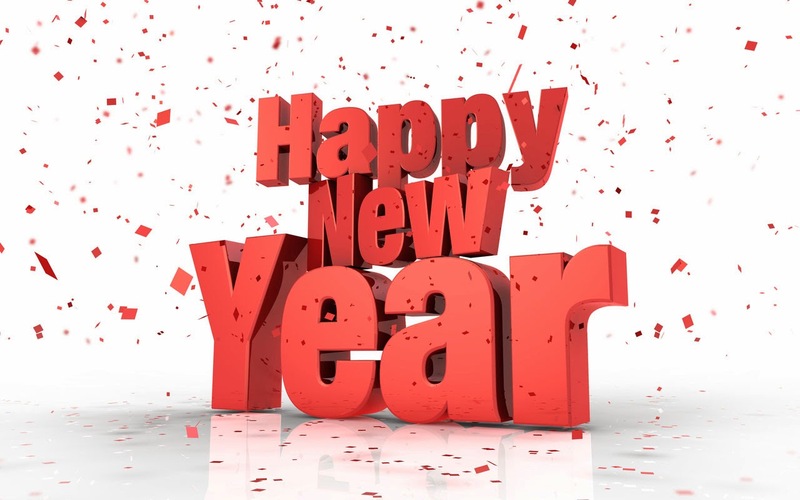 I wish the best of luck for everyone in 2014!